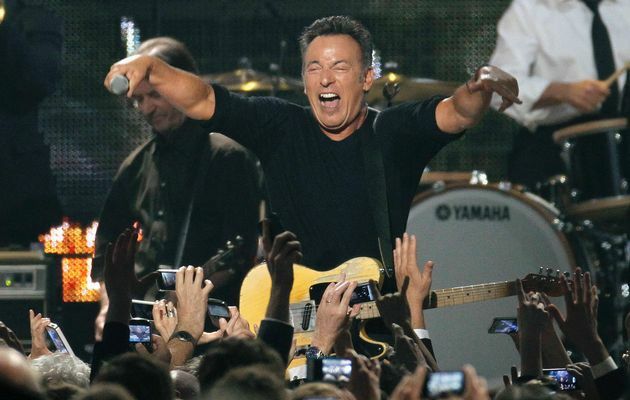 Did anyone see the Tribute to Bruce Springsteen on PBS the other night? It started out great. Hosted by John Stewart, it kicked off with Alabama Shakes belting out “Adam Raised a Cain” (singer Brittany Howard needs a tougher name) followed by iconic Patti Smith looking just as a soon to be 68 year old Patti Smith would look, and sounding great singing their collaboration “Because the Night.” Then I was kind of underwhelmed. I liked Sting doing his Bruce impression, but it was when Neil Young AND Crazy Horse came on all looking as old as the hills and performing “Born in the USA,” and rockin’ the house that my interest really returned. Something about it struck me funny, everyone up and dancing to Neil Young. Then at the end of the song, old Neil starts Brucing. You know, chanting over and over Bruuuuuuce, as Bruce fans are known to do. Neil always was an odd boy. As soon as the song was over, the ex called to let me know that if he had to catch the later train in the morning it was Neil Young’s fault, because he thought he would just fall asleep on the show but Neil’s unique performance made him want to stay up for the rest. The rest was Bruce luckily for me, because you know I love Bruce, and always will, but I am not up on his recent stuff that others were performing, and by recent I mean nothing much after “Streets of Philadelphia,” so I was glad he performed “Born to Run” and my tied for favorite with “Rosalita,” “Thunder Road” with the remainder of The East Street Band. So the ex did catch the later train, which didn’t interfere with our usual eating of bacon and eggs and going to see a good current movie. Last time, if you recall, we saw Birdman and yesterday’s pick was The Theory of Everything about physicist Stephen Hawking. A little slow for me, but a good English movie. While I wanted them to get into the science more, and get to it, I didn’t even realize that the movie ran over two hours. It does hold one’s interest. And I didn’t know beforehand that it was based on Hawking’s wife’s book (nor that she had written a book, or even that Hawking had been married with children). As both the ex and I enjoy watching the closing credits, I found that out after the movie ended and that explained a lot for me. I like Hawking even more now. He’s got a great sense of humor, I loved him on The Big Bang Theory, and I know that I will love him when he gets his wish and is cast as a Bond villain, which will definitely motivate me to do something I have not done in decades – go see a James Bond film. Yes, Hawking wants to be a Bond villain, and I think it’s a swell idea.